Loved the video of your Collection Portfolio. They are both beautiful. Definitely a great collection of memorabilia from your London trip and ingenious how you put your portfolio together. Hey show off....doing a video!! Just kidding! I just need to learn how to do them and I am jealous! Your folio is utterly amazing! Such a cool collection of photos, empemera and momentos from a fabulous trip. Love the papers you used; the colors. And the video is a great idea to take us on a tour of your folio! It is stunning! So Awesome Annette!! I love your Folio! Amazing! What a great way to remember your vacation. Love how you tucked in all the little things we all collect on vacation. Having it separated by day makes it fun and easy to follow along on the trip. best vacation collection folio I have ever seen. you really "get it" Annette! Great job! OH MY GOSH!!! Where do I start! It was amazing in the photos, but the video of it just blew me away! Absolutely the best folio I've ever seen! I love that you collect so much stuff on a trip, just like me, just like so many, and you use it all up to remember ever part of a trip...LOVE!!! This thing was so interactive, so fun, turn after turn, page after page....just a WOW!!! I am going to show my students this video when I teach my folio so they know to fill it up with amazing turns and twists just like you! YOU ROCK!!!! PINNED!!!! what a stunning piece to have and i LOVE how you collect and save and showcase everything! I followed along with your trip last summer via FB and now it's great to see all of your awesome photos in this folio. You are such a talent Annette!!! Love the British flag washi tape too. :) Off to watch the video now, yay! Your vacation folio is amazing!! I love how you added additional pages and flaps did you used paper hinges washi tape, or something else to make you hinges? 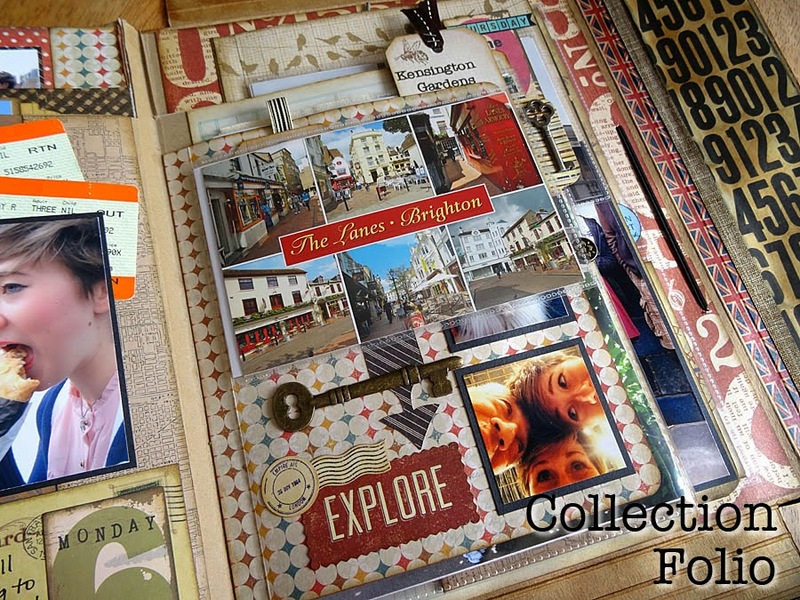 This is so brilliant Annette, wow, I love the little folio, but the big one is just amazing! What a wonderful keepsake of what must have been the trip of a life time! Love all the additional hinged flaps, pockets etc, - you have really utilized the folio to the max! I feel totally inspired now to take my folios out and have a play, - thanks for that too! Annette your London folio is super! I enjoyed seeing all the photos and hearing about your trip. It really is awesome to see other places that I have never had the opportunity to go to. Sounds and looks like the trip was a blast. TFS! Dear Annette, good morning! That is the most fabulous "eclectic mish mosh" I have ever seen!! My bicycling husband is back down in your state as I write this & I wish I was down there too! First I wanted to congratulate u on your post yesterday for making the packaging on the new G45 boxes (that is SO cool!!!) - I can't wait to go to my fav scrappin store & see u there! And also for sharing your beautiful London portfolio-u never cease to amaze me!! Miss u, Cathy C.
Hey, Rock Star. This is just awesome! I think you may have explored and executed every possible possibility imaginable. By anyone. Ever. Seriously, this is just way cool and it doesn't hurt that the three of you are so pretty, either. Unfair advantage. WOW !! An amazing trip .. put in a super amazing folio. What a great way to keep the memories. The video was cool too !!!! Oh!! I wish I had one of these for all the trips we've enjoyed over the years! You are so clever in your organization and layering. I will endeavor to do this in the future when we travel. How smart to keep all the little items as you go and track the days activities. Beautiful and inspiring work! Wow, Annette! This folio is absolutely over-the-top! Your video is so well done and really helpful as you have so many awesome parts of it to share! I love, love, love! I would love to find photo pockets that hinge that way! They work so perfectly in that folio! Every detail is so amazing! Love how you incorporated at the ephemera as well. I made a trip to England a long time ago that I have wanted to document at some point - may have to copy this idea! Holy papercrafting genius, girl, these are INCREDIBLE! Just perfect. I love the video, too, and wish I'd seen it before I made my own Folio, because it's chock full of great ideas! 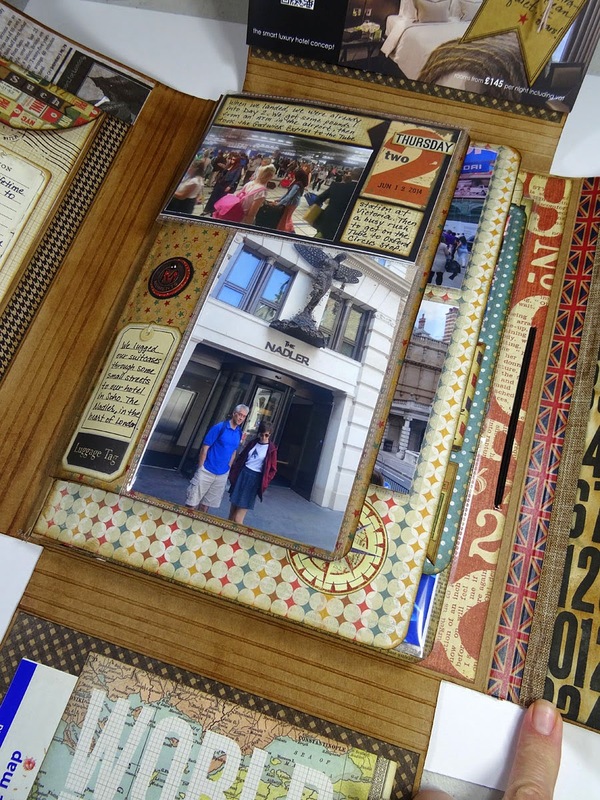 Your travel journal is amazing-- I can't think of a better way to store the ephemera of your wonderful vacation. Umm you had me at your FANTASTIC cover! Seriously stunning. I'm on a Folio high! Good Golly, Annette, this is one amazing album! I love it all! Those flip/flaps are such a great idea to use on this kind of project with so many photos. And I love that you've used Tim's pocket pages, too--genius! Looks like a wonderful vacation, and you have given all those memories a beautiful place to be stored for years of recollection. OH my what a treat ... two folio's and a video ! Love, love , love the wall paper folio! London folio packed with awesome ideas, flip photo pages and pockets ... oh my ! Yep another amazing project from you Annette!! I chose to give my folio the London treatment too. I love how you used this to document your journey. So special and fun! 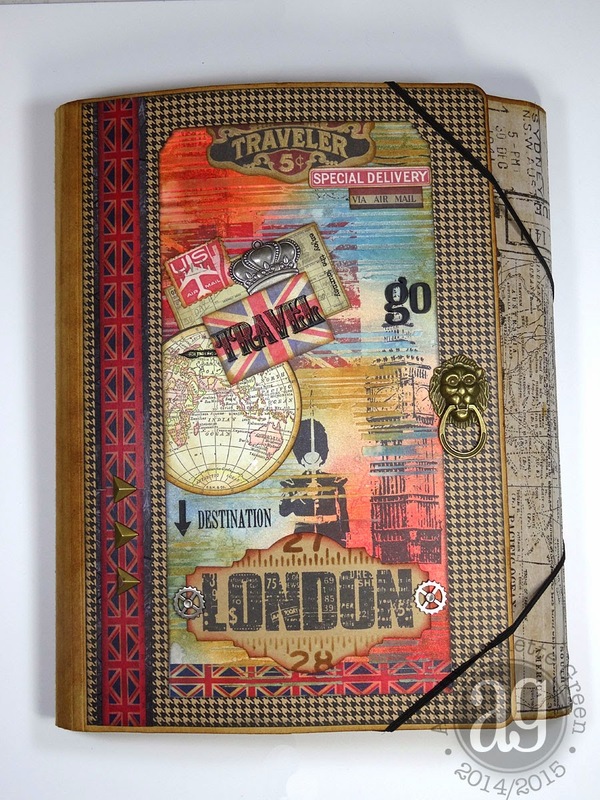 Annette, Your London folio is AMAZING! So many great ideas and so many memories beautifully displayed. Thanks for all the ideas on how to maximize space. We are planning a trip to Europe in a year and you have given me so many ideas. You video gave me SOOOO many great ideas for my little folio on our trip to Tahiti. Thanks so much for making it and sharing your tips and tricks for expanding display space! And the total folio makes me so homesick for London(we lived there for 5 years) and make me wish we could go back to see the places we missed in the UK (York, the Cotswolds, Ireland...)! I'm not worthy! (in true Mike Myers fashion!) Even when i save all my travel bits, I can't get organized to create what you did! Your folio is stunning!! And your video was incredibly helpful for using the cascading piece as it was perplexing me! So charming. thanks for the video walk thru too! Wow, thanks for the awesome video. Looks like you had a fabulous vacation. This is a fabulous folio...fantastic! Wow, just...wow. What a beautiful folio Annette. What an awesome keepsake. You did an amazing job! Annette - this folio is wonderful! Thanks so much for the great ideas. Such a beautiful folio!!! Love the cover and the inside has so many memories! I love that it's functional too with actual photos and journaling! Not just another gorgeous project but a treasure of family memories to keep! Thanks for the video too! Love the lion! Very cool!! I can't wait till we GO on our journey so I can REALLY fill mine like this! Just...too bad U couldn't fit the real Paul & real Ringo into this little thing...hehehee!! Do you have a tutorial on how to add so many pages to the folio? I'm a beginner and I'm making one of these folios for my parents 50th anniversary. Absolutely love your folio. I have been looking for inspiration for doing my folio. Using the flaps for whole pages is just what I thought I would do. Also, the clear pocket pages are awesome. I am going to get me some of those.. Thanks for a great video.